A bad posture can be the root cause for many health disorders that a lot many office workers or dedicated gaming lovers usually suffer from. It’s important that people find a solution because comfort is the ultimate need that everybody looks out for while they are working for a long stretch. The ergonomic chair AKRACING AK-7018 is completely suited to the dynamics wherein people are ensured to find what they are looking for and so it has been made with commendable care and every detailing has been given particular attention. It will of course leave a positive impression on the user’s health and moreover will also give the user a real time feel of a virtual environment that you might have never experienced before. Here is the AKRACING AK-7018 gaming chair review which you might find helpful. • Height and backrest adjustment – The lever which is located under the seat can be pulled to adjust height to a desired setting and so can the lever that is located at the side can be pulled to set the backrest. • It also has a rocking function that allows the chair to be tilted till 12-degrees. • The chair is also decked with a phenomenal feature of Class-4 gas lift that allows the chair to hold a maximum of 150 Kg at any instance. • The main attraction is the metal frame which keeps it strong and gives a sturdy look. • Every user has had an exceptional experience with this gaming chair in terms of comfort and feel. • It is worth the amount that is invested on it and has an easy-to-assemble tag. It does not take long or does not require a professional help to assemble all its parts together. • The material that has been used in its built is of high quality and does not give away a cheap appearance even at such low costs. • The arm rest is also adjustable and looks great for all purposes. The chair has only one drawback that the wheels do not keep in place when being moved at a fast pace. This is the only complaint that the users generally give but is negligible when weighed against the number of noteworthy features it provides. 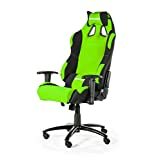 This gaming chair is a must-buy product, it provides the best of features at an affordable price. Moreover, there is no compromise with the quality that is used in its built. It is also available in a wide range of colors that you will love absolutely. The wheels are durable enough and do not leave scratches on the floor which is why people find it even more appealing. The chair will give you the feel of sitting inside a sports car because it has been designed so that every detailing resembles it. All the gaming lovers will absolutely acknowledge the alluring features it is decked with. So what are you waiting for? Quickly embark on your coveted pick!